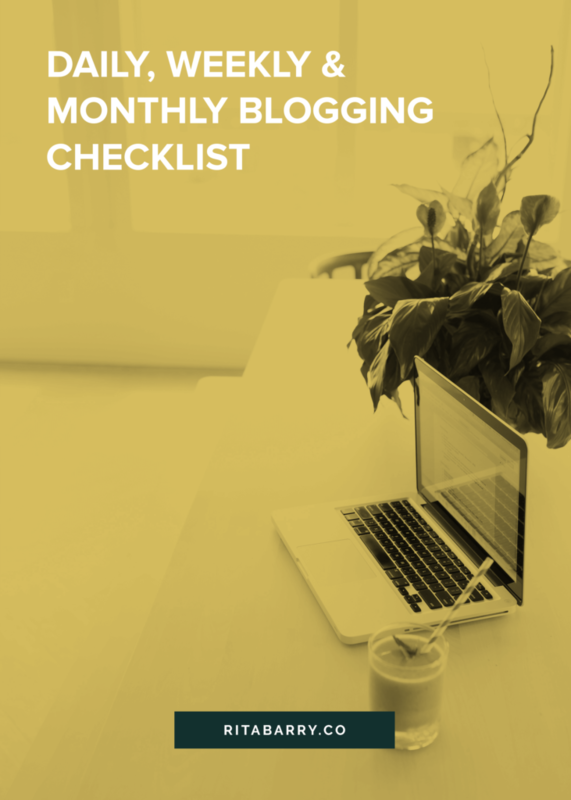 Daily, Weekly & Monthly Blogging Checklist · Rita Barry & Co.
Do you remember before you started blogging when you thought that writing a post was going to be the most time consuming thing you had to worry about? Yup, me too. And then came the social media, the emails, and the projects that never seemed to get done. There’s a lot more to blogging – than blogging. So how do you get it all done, and stay consistent without letting this whole blog thing take over your life? Two weeks ago we covered the simple technique I use to maintain focus while working online and today we’re going to dive into part 2, knowing what tasks to do each day, week and month to move your blog forward. One of the biggest time wasters for new and old bloggers alike is jumping around from task to task without any real sense of purpose or direction. This week, let’s try something new and see if we get a better result! Each weekday I complete the following tasks with the help of my favorite blogging productivity tools. This is where the majority of my time is spent – in the tasks that make up my weekly routine. I’ve found that when it comes to things like heavy social media use or blogging, daily is simply beyond the time I have available so I break it down to a few times a week to make the whole process more enjoyable. Now my weeks don’t always look like this but it’s what I shoot for, it’s the ideal. I’ve found that simply having a guide always works out better for me than when I just winging it. If I have a number of weeks in a row that are way off of my ideal – it’s time to re-examine my expectations or my commitments and make changes. Wednesdays are usually Skype days. I try to plan all my client coaching, interviews and other “on camera” time together because I found it most efficient. Breaking down the process of post writing into smaller steps has really helped me enjoy the process more and write better content (at least that’s the goal!) It also feels more manageable and that I get it done faster each week than I used to when I did the whole process in one sitting. Of course if you write multiple posts per week, your schedule is going to look a bit different but the idea is still the same. During the week, I also have blocks of time scheduled for the priorities I firm up during Sunday’s planning session. This can range from client design projects, personal website improvements or creating new products and services. Monthly tasks were often the ones that slipped through the cracks because I didn’t do them often enough to make them become a habit. Once I added them to my monthly list, they started getting done and I was able to make improvements and informed decisions. What’d I miss? Any tasks you find yourself doing again and again (or putting off all the time) that should go on the schedule? Rita Barry is a marketing measurement and paid traffic specialist who helps online entrepreneurs understand how their marketing is driving sales so they can sell more. You can learn more about her here. Ahhh, again, another breath of fresh air! Organizing my schedule can be elusive and daunting–here you provide direction. Is mine going to look exactly like yours? No, probably not. But the comfort of knowing how a successful blogger like yourself breaks it down is encouraging enough to make me get on the ball! Thank you. Just created a new Evernote notebook with three notes; daily, weekly and monthly blogging chores. I broke it down by day, like you did and am amazed to see how much time this all really takes…. I really need to put a schedule much like this into effect. I tend to waste a lot of time doing “something” which in all reality is not much of anything. I also need to invest in CoSchedule! I used the free trial and LOVED it! Totally off topic, but do we pronounce our names the same? sure-ree? Rita thank you so much for this! I printed it out and I’m going to hang this on my desk. Consistency is my biggest hurdle. I for sure have at least an hour everyday I can dedicate to my blog, it doesn’t feel overwhelming when I look at your schedule. When I do take this time it’s totally unfocused and I end up going down unnecessary rabbit holes and am totally unproductive then that time is up. I really think this is going to help me. Thanks again! Thanks for posting your checklist along with the thought process behind each step. I have a full-time career and a busy family so my third life as a musician (which my blog is a part of) really takes a back seat. This list will make it really easy to schedule in time to consistently keep up the blog part. thank you for this schedule. I sooooo need it. You have helped me make sense of the chaos!